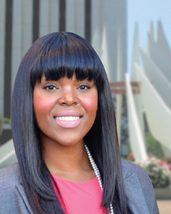 Having already knocked out incumbent Mayor Eric Perrodin, young and polished urban planner Aja Brown has set her sights on another former mayor of the Hub City in her quest to become the second woman in the history of Compton in the June general election. “I believe Compton is a beautiful city,” said Brown who is running against Omar Bradley to become Compton’s next mayor. At 31, Brown is city’s youngest mayoral candidate to since 1973. She’s new to the political scene, but as a third generation resident (her grandmother and mother grew up there) and city employee, she knows exactly the kinds of changes Compton needs. “A lot of issues that we have in the city are not because we don’t have the funds, the finances or the ability, but we just really need to have a new system in place,” said Brown during an interview with the Social Justice Coalition posted on her official campaign website. “All of our systems are thirty years old. Our general plan is 30 years old… That’s the policy document that really guides the community forward. We don’t have a zoning ordinance, which is the legal tool that cities can use to move the community forward. We don’t have things like a capital improvement plan, which really is your public works blue print for how you improve your city. A native, Brown was born in Compton, but her mother moved the family to Pasadena after her grandmother was murdered in her home, she said during an interview. After earning a Bachelor’s Degree in Public Policy, Urban Planning and Development and a Master’s degree in Urban Planning with a concentration in Economic Development from the University of Southern California in 2005, she began her career as an urban planning commissioner in earnest. She has worked in Pasadena and Gardena and has been living in Compton with her husband Van Brown for the last four years. Brown cites corrupt politicians and mismanagement of funds as blame for Compton’s misfortunes, but she is willing and ready to change that. Her vision is to have a plan in place to mitigate all of that. It involves youth and economic development and crime reduction. She also wants to “re brand” Compton and restructure its government operations she said. “Youth Development initiatives, collaboration and direct investment will mitigate crime, improve educational attainment and create positive outlets to develop the city’s next generation,” according to Brown. She believes youth development will have an immediate impact on the quality of Compton’s school system and wants to reach youth at every stage of their educational development to transform schools. She has clear cuts goals about reducing crime in the City. Another priority is “rebranding” the city, which has long held a reputation for being synonymous with crime and corruption: “The ‘ReThink Compton’ branding campaign will include a variety of projects to showcase the positive aspects, people, and progress of the city through various media formats and partnerships. Moreover, “The external strategy will focus on reconstructing Compton’s image through a variety of means, including positively marketing the many great initiatives and achievements throughout our community,” Brown added. “I believe I will be one of the first mayors to really focus on policies. We’ve had some mayors do some good programs but we really need to look at the policies in the city of Compton,” she explained. While some many consider Brown a newcomer to politics, she is not a without the support of Los Angeles County Board of Supervisor Chairman Mark Ridley-Thomas and other prominent organizations, and perhaps she is just right for Compton as it’s next mayor.